Moebius Noodles is Now Available! Moebius Noodles: Adventurous Math for the Playground Crowd, by Yelena McManaman and Maria Droujkova, illustrated by Ever Salazar, is a gift to parents and kids everywhere. 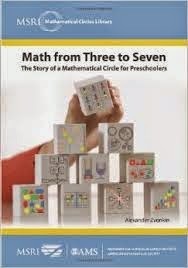 The book is full of ways to grow mathematical eyes, with very accessible activities. I wrote about Maria's crowd-funding campaign back in 2011. She raised $6200 back then, and is sending out lots of books to the funders. (Can't wait to get my copy!) If you didn't join in then, you can still buy a copy for $15. If you have anyone in your life with young children, I think they'll love it. If you're just as comfortable reading your books online, you can get a pdf at whatever price you choose to pay (from zero to infinity). I like this model. When I wanted to read Little Brother, by Cory Doctorow, I downloaded the free copy.I had already bought a copy for my nephew the previous xmas, and wanted to know how good it was before spending any more money on it. I loved it, and didn't hesitate to buy a paper copy of another of his books, Makers. (Also available for free.) I've bought lots more of Cory Doctorow's books than I would have if the free copies weren't available. So we're both happy. And I believe Moebius Noodles will work out the same way. You can download the pdf for free to get a taste. And, if my guess is right, you'll be eager to fork over the $15 for a print copy that's easy to share with little ones. Passages such as this make me think Galileo was right to explain his cosmological theories in a dialogue between actual characters. Maybe we should routinely present mathematics as a conversation between two people striving for understanding rather than as persona-free perfection. I agree with Susan Colley that presenting math as conversations is a good pedagogical device. I'd like to try it. One benefit of writing this way is that it's possible to explore a problem more fully without giving away any punchlines. Of course, it also adds interest. Would any of my readers be interested in writing short dialogues on selected topics? Summer's coming, and I like to think during summer about topics in my upcoming courses that need a better introduction than what I have available so far. I'll be looking for other people's goodies online, and I'll be thinking about how to create my own. I'll be teaching pre-calculus, calculus I, and linear algebra in the fall. My long handout for finding the derivatives for sine and cosine went over like a bag of cement. I might be able to enliven that with a dialogue. And I'm thinking some of the first topics in linear algebra might do well with this treatment. Check out The Cat in Numberland (a delightful retelling of the Hotel Infinity story), in which the storyline, more than the dialogue, helps the reader understand infinity more deeply. I also loved working through some deep mathematics in the book Surreal Numbers, by Donald Knuth, which has more of the style of Math Girls. Alice and Bill are lightly sketched characters, exploring mathematical ideas together on a secluded beach. Are there other books you know of which present math through dialogue or story? Would you like to write a short story or dialogue with math at its core? Let's form a math writing group this summer! Last year I ran a poll to see how many people would buy this book if the price were reduced. The publisher, AMS (American Mathematical Society) publishes mainly scholarly works, and originally priced it at $50, in line with the prices of their other books. (Yikes!) 96 people said they would buy this book if it were $20 or less, and now it is! I loved reading Math from Three to Seven. Zvonkin worked with his young kids and some of their friends, and documents his successes and failures with them. He had lots of great ideas for getting very young children to think about deep math. When I read it last year, I had access to an online copy. I have just now ordered a real book, so I can turn down my favorite pages and find them again quickly. The people at the Math Circle Library have been working with the folks at AMS to change the pricing structure for the math circle books. The prices of seven of the twelve books in the Math Circle Library series have been reduced to $18.75*. I ordered Math from Three to Seven, Math Circle Diaries (aimed at grades 5 to 7), and Invitation to a Mathematical Festival. This book is not a guidebook. It does not purport to show you how to create precocious high achievers. It is just one person’s story about things he tried with a half-dozen young children. On the other hand, if you are interested in running a math circle, or homeschooling children, you will ﬁnd this book to be an invaluable, inspiring resource. It’s not a “how to” manual as much as a “this happened” journal. ... Just about every page contains a really clever teaching idea, a cool math problem, and an inspiring and funny story. If you buy it, let me know what you think. *The pricing on the AMS site may be a bit confusing. They show a list price and a lower price for "all individuals". If you haven't set up an account, the price will initially show up as the $25 list price. Once I logged in, it changed to $18.75. Vila has written about the math in the video here.